Vavasor Jones was born in Porthmadog to Captain Morris Jones and Ellen Jones, of Bank Place, Porthmadog. He was educated at Portmadoc County School. He began a career with the Alliance Assurance Company, based at Wrexham and later Southampton. By November 1915, he had enlisted and was at the Inns of Court Officer Training Corps. Serving with the Royal Welsh Fusiliers, he was promoted to Second Lieutenant in September 1916. After his father’s death, his base when on leave in North Wales was Dol Caradog, Ty’nymaes, Bethesda. His uncle, Rev Owen Jones, lived in Bethesda. 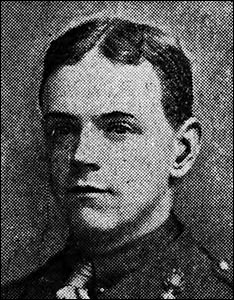 Vavasor left for France in March 1917 and was killed in action on 19 May 1917, aged 27. He was buried at Dury Crucifix Cemetery, near Arras. His brother, Dr Arfor Jones, served as a Captain with the Royal Army Medical Corps in the Gallipolli campaign and in Egypt. Arfor survived the war, despite becoming dangerously ill in 1917.